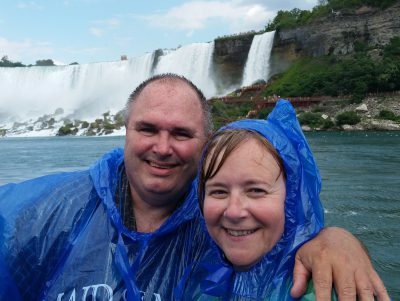 July 15, 2016 (by Jimmy) – When Angela and I go on an adventure, we normally have a day where we plan a special treat. This treat is a special event or a special place that one or the other of us have been wanting to see. 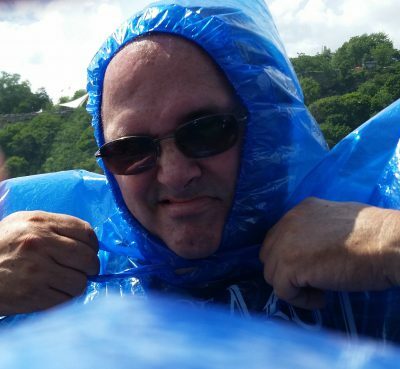 During this trip we had two, and they happened to coincide with the mid-point of our adventure, and I call them wet and wild. 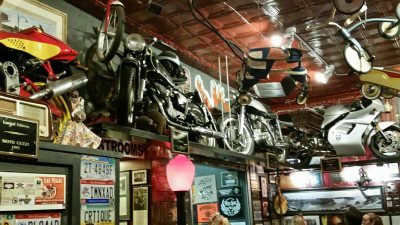 WET – The first is a place where Angela had been before, but I had not. 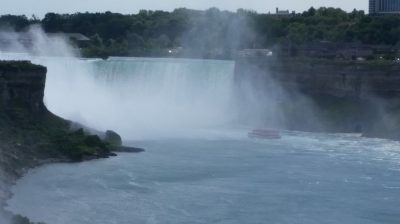 I’ve wanted to see Niagara Falls, but the opportunity never availed itself until now. 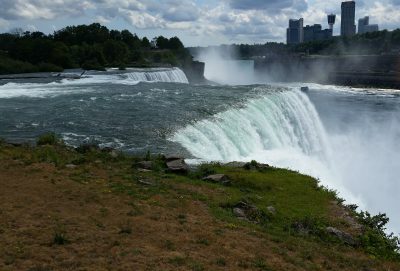 So we left Erie, PA heading to a campsite near Buffalo and Niagara Falls, NY. 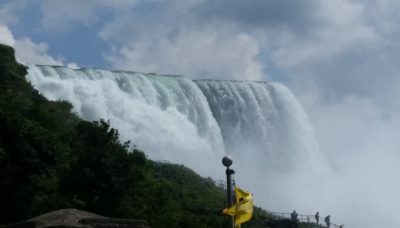 We arrived around noon and quickly set-up the RV and turned on the air conditioning, so the dog would remain cool, and headed off to see the falls. 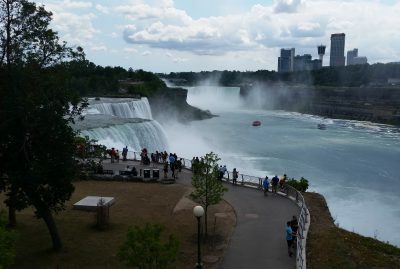 We got behind a bunch of folks heading to Canada but were soon able to turn into the Niagara Falls Parking lot and found a place to park. 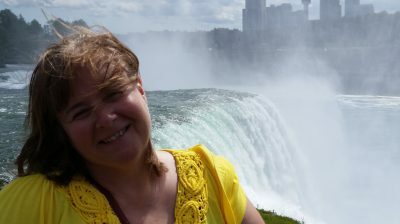 At my first view of Niagara Falls I was awestruck. I put this up there with seeing the Colosseum in Rome or the swimming pool where Mark Spitz won his seven gold medals in Munich. Angela said I went into 12-year-old mode, not caring who was around me, just wanting to see more. I have to admit, when I see something this exceptional, I do have a tendency to get carried away. I did have the mind set to take a few pictures though. Enjoy. 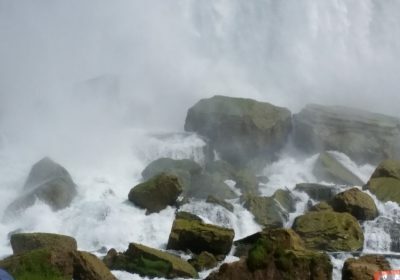 TV does not do the falls justice; you have to go here to experience the natural beauty. This is the Observation Deck where the first pictures were made. 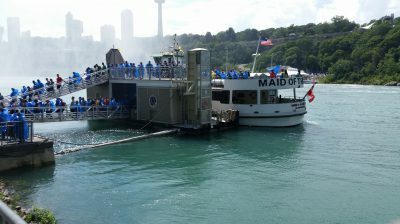 An elevator inside brings you down to Maid of the Mist. 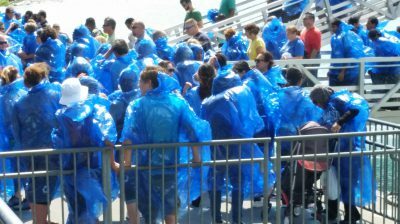 They do Recycle the Trash Bag Ponchos when you are done with them. 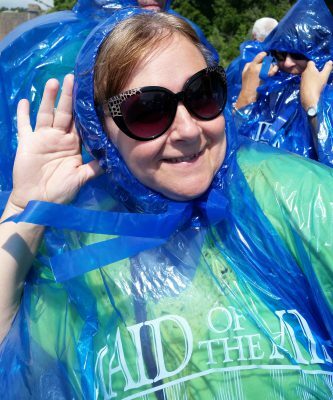 Angela – I look good, I am made for the mist, This poncho matches my eyes. Jimmy – You have it on backwards, You just stuck your arm through the head hole, Am I going to have to dress you? As we pull away from the dock. 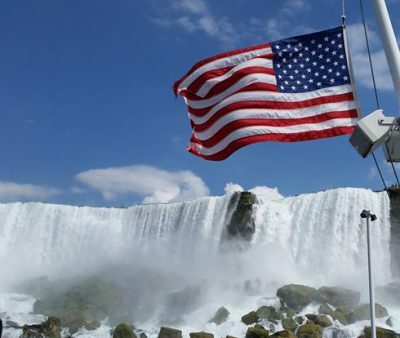 The American falls – Sometimes everything comes together to make a perfect picture. 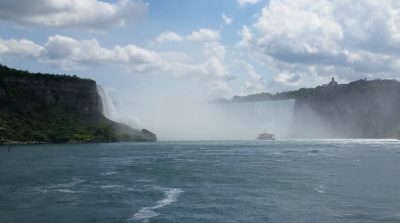 Maid of the Mist boat going into the mist. If I would have known the impact, I would have brought a bar of soap. 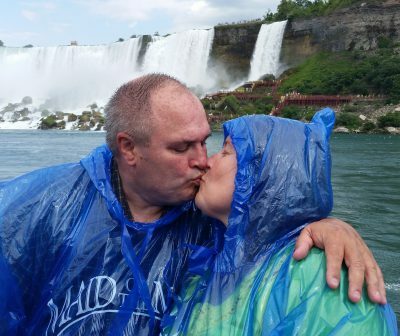 Honeymoon Capital of the World -there has to be a kiss picture. 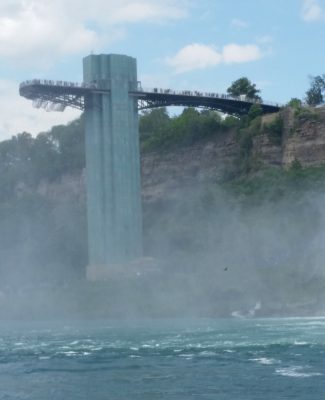 Niagara – Definitely put this one on your must see list. 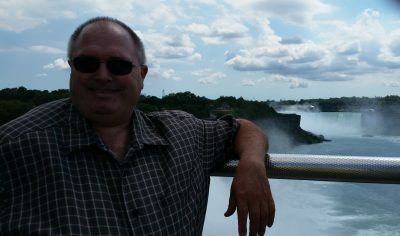 Wild (Wings) – After we left Niagara Falls, we went back to the RV to check on Chewie and take a quick nap before our second treat of the day. 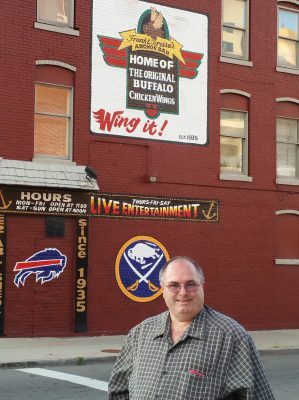 As a history buff and one that loves the story about the origin of pretty much everything, I felt it necessary for us to visit the place in Buffalo where the Original Buffalo Chicken Wings were invented. 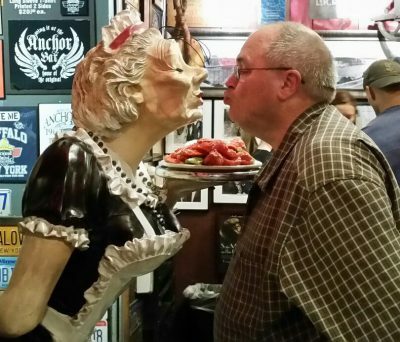 This happened in a place called “Frank and Teressa’s Anchor Bar. We found the place and headed that way. 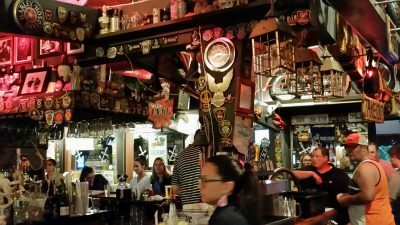 Now this was an also a great treat for me, and I put it up there with having a drink in Boston at the Bull and Finch (from the TV show Cheers) and staying at the Waldorf Astoria in New York (Okay the Waldorf was cooler, but the significance was similar). 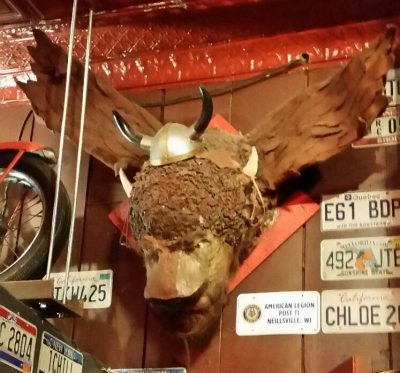 The Buffalo Wings were invented in 1964 when an order of wings were received instead of necks (used to make the spaghetti sauce). 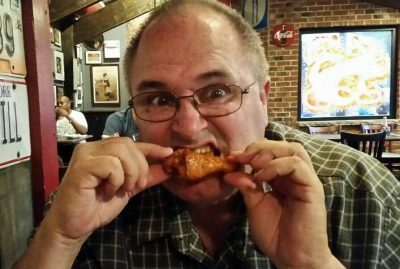 Frank Bellissimo, not wanting to throw out the miss-order, asked his wife Teressa to make something out of the wings to pass on to the patrons, and the hot wing was the result. 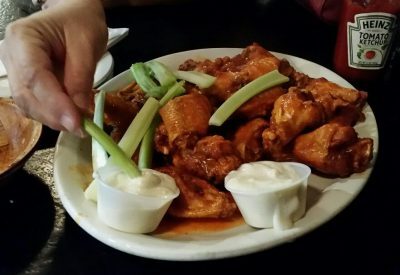 Now 52 years later, what would a Super Bowl be without a huge plate of hot wings. Original Hot Wings – 20 piece Hot, served with celery and blue cheese dressing just like in 1964. You might want to let them cool for a minute before you take that first bite.